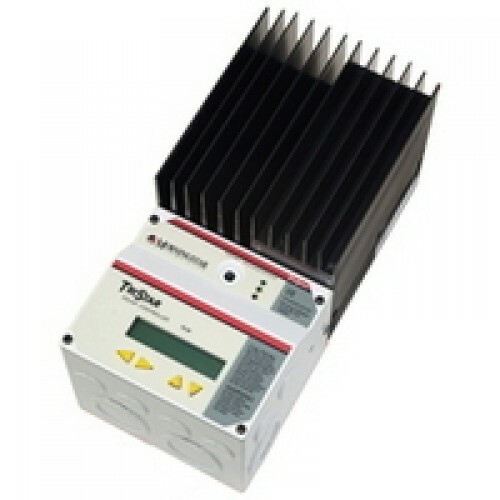 Morningstar's TriStar MPPT solar controller with TrakStar Technology™ is an advanced maximum power point tracking (MPPT) battery charger for off-grid photovoltaic (PV) systems up to 3kW. The controller provides the industry's highest peak efficiency of 99% and significantly less power loss compared to other MPPT controllers. The TriStar MPPT features a smart tracking algorithm that maximizes the energy harvest from the PV by rapidly finding the solar array peak power point with extremely fast sweeping of the entire I-V curve. This product is the first PV controller to include on-board Ethernet for a fully web-enabled interface and includes up to 200 days of data logging. Enables system monitoring, data logging and adjustability. Uses open standard MODBUS™ protocol and Morningstar's MS View software. Warranty: Five year warranty period.